I’m a big fan of brainteasers and puzzles, especially the metal manipulation ones, where you have to unlink two or more objects that are somehow entangled together. This past weekend, while on vacation up in Cooperstown, NY, we stopped into a store called Riverwood Gifts right on Main Street where I found a fantastic puzzle. Normally, I can solve these things within a few minutes without much effort, but this one had me stumped. I probably spent a good ten minutes studying it, and just couldn’t figure it out. We left the store to continue shopping, but we went back the next day. Having a night to sleep on it, I managed to “solve” the puzzle … by which I mean, unlink the two pieces, but I hadn’t truly “solved” it in the sense of understanding the solution. In other words, when I put the two pieces back together again, I couldn’t immediately re-solve it! This puzzle was great! I rarely find a puzzle that can do this to me. 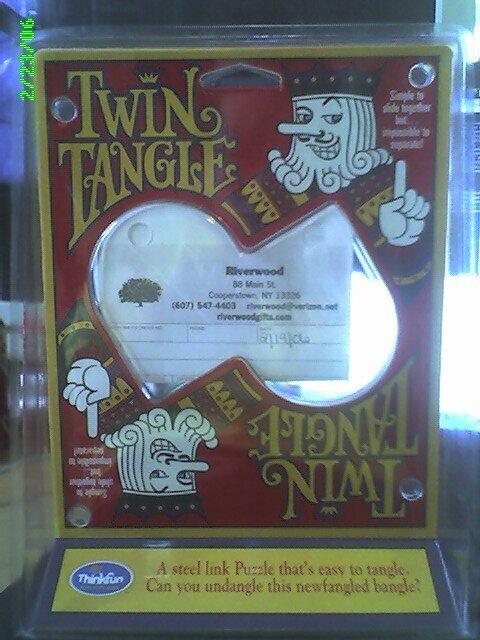 The puzzle is called Twin Tangle by a company called ThinkFun. 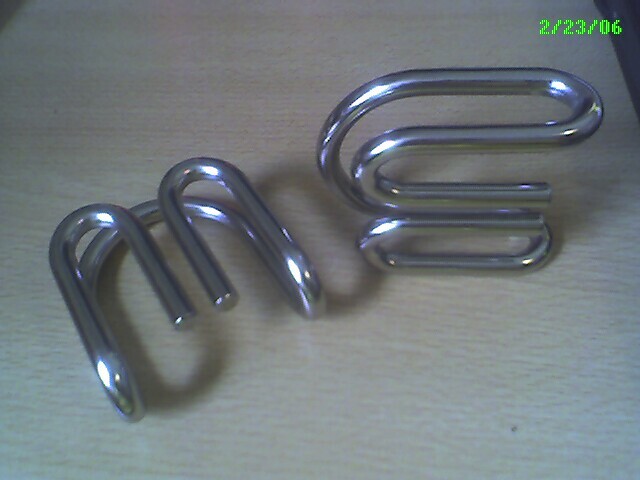 It’s two seemingly identical pieces of steel (they may actually be identical) which can be linked together by sliding them together. The design of the puzzle is so incredibly simple and elegant, but the solution is actually quite unintuitive which makes it a challenge to solve. Do you like puzzles? Have you found any that you found especially challenging? One that you had to really study in order to understand the solution so that you could repeat it reliably? Tell me about it in the comments below. They are fun to do, we do those all the time here as a stress reliever. We bend them and wrap them around to keep it interesting as well. Uh, you might have puzzles like this one, but do you have the Twin Tangle? The fact that you say you “bend them” suggests otherwise — these things are nearly 1.0cm diameter solid steel. Would take some wicked force to bend these things … not something I’d do casually. But, yes, these things are a great way to distract your brain when you’re working on a problem, etc. 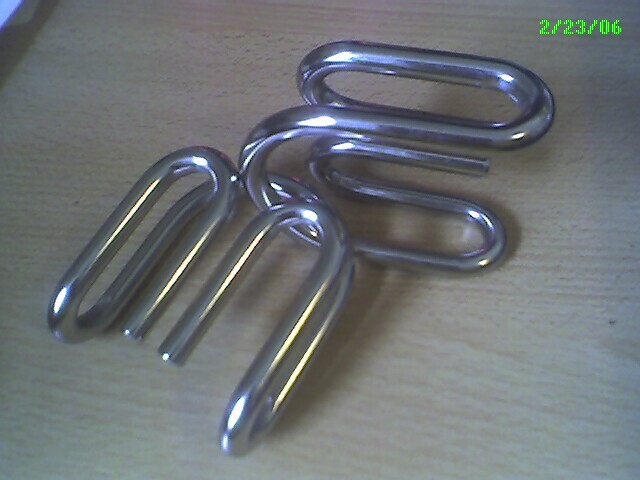 can you give me the step by step instructions for the twin tangle puzzle? Cindy: I think that giving out the solution is a kind of cheating and takes away from the cleverness of the puzzle’s inventor. Don’t give up. It’s quite a hard puzzle. The solution is definitely non-obvious. But, it is solveable and once you do figure it out, it’s really easy.